But walking around VRLA -- the biggest expo of its kind in the world -- it was clear: the dream has arrived, and it finally is a reality. The buzz of excitement and cutting-edge technology everywhere I turned left me saying to myself, "This is the future. I'm living in the future." 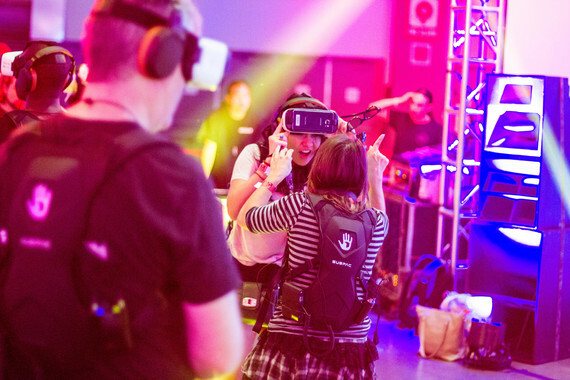 Since its inception in 2014, VRLA has grown by a rate of 40x, ballooning from a small local meetup to a two-day event with participants from all over the world. The Summer 2016 expo hosted over 6000 attendees, who had the chance to demo technology and content from over 100 vendors. With numbers like that, in an expo regarded as the premier event of its kind, there's no way to appropriately highlight all of the many (many) exciting developments, announcements, and experiences on display, but here are a few that totally knocked my socks off. Part storytelling tool, part sharing platform, Mindshow is the next revolution in virtual reality. Seriously. If those words sound melodramatic, Mindshow is anything but. The minds behind this app sought to build something that draws out the sense of wonder and imagination we had as children. As soon as I hopped in, that's exactly what happened. I'm so excited about this thing it's hard not to just fill this whole section with exclamation points. The intro video above offers a glimpse of what it feels like to create inside Mindshow, but you have to experience it to fully grasp what it will mean for us down the line. As I've said before, the most successful content in VR will be that which affords audiences the chance to participate. In this case, Mindshow provides the environment and the characters, and then it's up to you; you're the writer, director, and actor(s). You position the characters, "become" them with your own body and voice, compose the scene from start to finish, record it, and voila, your very own VR story! The recorded scenes can then be played back from any POV. VR is a medium of convergence -- it brings a variety of art forms under one roof to create something totally new. Mindshow is the greatest embodiment of this spirit the world has yet seen. Like virtual reality itself, Mindshow incorporates our favorite pieces of existing forms and molds them into something totally new. This is where the collaborative fun kicks in. Plenty of apps let you send or broadcast your content, but Mindshow takes it to a whole new level. After you've finished your piece, you can send it to your best friend, your nephew, whoever. Now they can hop in and make their own additions, taking the story in a totally new direction before sending it back to you. Set, repeat. In Mindshow, there's no line between "consumer" and "creator." Art and social media merge to create a process where we all play both roles, and the beauty lies in the sharing. Mindshow has single-handedly created a new art form, and its impact will be felt for years to come. 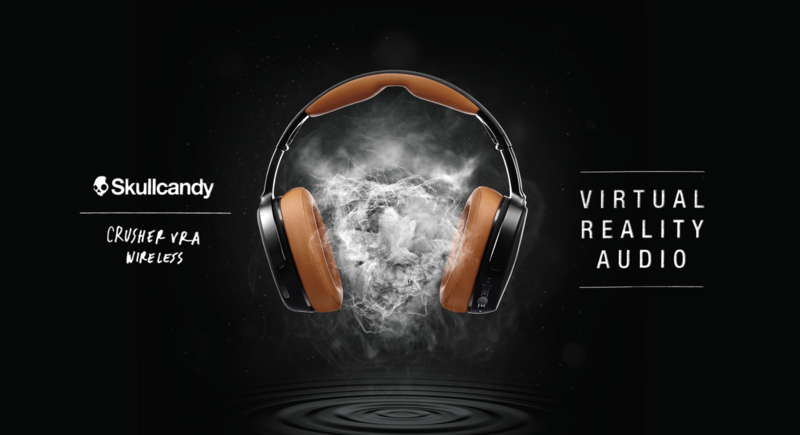 Engineers, sound guys, musicians, audiophiles and everyone in-between: rejoice! 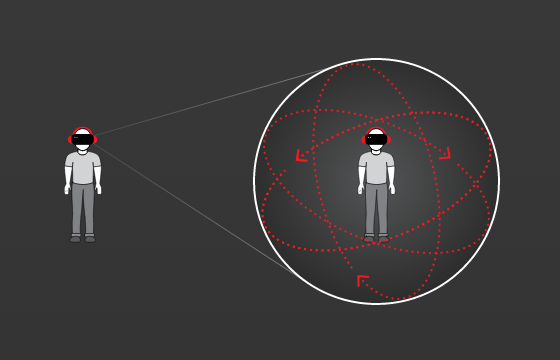 Here's a soup-to-nuts solution for VR and 360° audio. 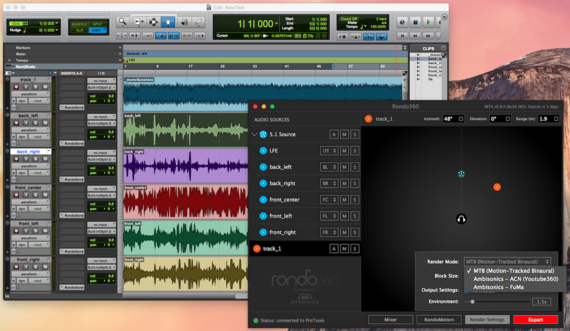 It's called Rondo360, and it's an entire workflow system from capture to creation to playback. 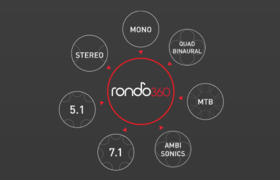 It starts with their 360° microphone: the RondoMic. This thing captures spherical audio via 8 microphones, which allows you to recreate sound as it exists in a spatial environment: three-dimensionally. Best of all, this is the world's first 360° mic you can use for live broadcast. That's VR audio. Live. To test it out, Dysonics put me into a 360° video of live comedy. I kept hearing laughter to my right, unnervingly close to my ear. I initially assumed the person standing next to me at the conference didn't have the world's most extraordinary powers of volume modulation...until I looked to my right in the headset, which is when I realized the laughs were coming from the guy next to me in the experience. It's what I was hearing through the headphones. The sound was that realistic. 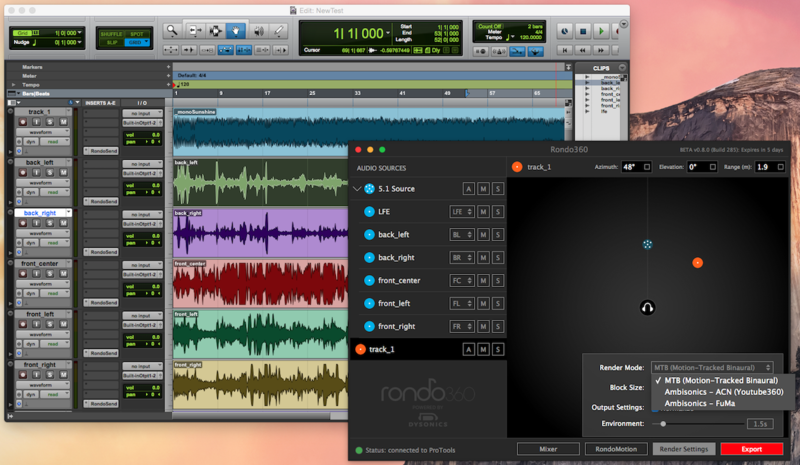 After you've captured amazing 3D audio -- or equally, while you're capturing it -- you want to be able to mix and edit. Dysonics' mixing tool was built to work seamlessly with all major digital audio workstations, and the layout will feel intuitive to anyone familiar with sound-editing software, but the component that really shines is the positioning feature, which allows users to place discrete sounds anywhere in a 360° space, group them in whatever configuration, and test the results in real time. In order to fully appreciate the capability to record live and tweak your mix, you need a fluid way to hear what's coming through. That's where the RondoMotion wireless sensor comes in. By attaching this small positioning sensor to your headphones, you get real-time 360° motion-tracked playback. When you change your position, the sound changes with you, communicating the full dimensionality of the sound environment you've created. 2016 is the watershed year for VR audio. 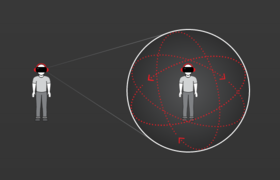 Sound is how our brains internalize space; if the dream of VR is immersion and presence, audio must be treated as integral in facilitating accurately spatialized environments -- and the industry is catching on. 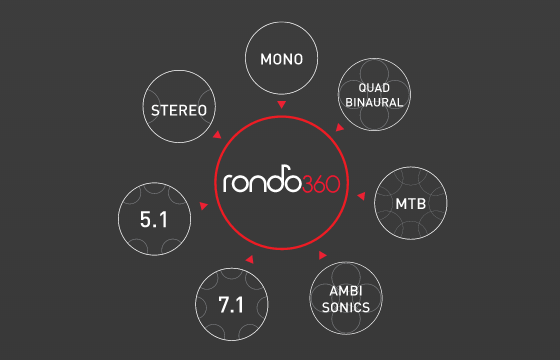 With Rondo360, Dysonics has revolutionized audio for immersive media. This is future-forward VR sound at its absolute finest. Keep an ear out for these guys. They've got some exciting announcements in the works. If we're going to have such amazing dimensionalized sound, we need hardware to fully appreciate it, right? I'm a stickler about my audio fidelity. I'm easily turned off by the "crank the bass" ethos of so many headphones, and as someone who's never dabbled in Skullcandy products, I really didn't know what to expect when I went to try these headphones out. I was absolutely blown away by the Crusher VRAs (and I mean that somewhat literally). There's a lot to rave about with these headphones -- the team behind them put their hearts and minds into building a groundbreaking high-end product, which means there's a lot of complicated science I won't pretend to grasp -- but what you need to know is that their directional bass gives sound a physical presence. It's something you feel as much as hear. The stereo haptic bass delivers actual vibrations to your head through ferrofluid-suspended coils (magnetic filaments in liquid), so this isn't just good bass -- it's a totally new breed of bass. And in the emergent spirit of VR, the capacitive screen allows users to find their preferred intensity with their fingertips. I've never heard or felt anything quite like these. But for all the fancy proprietary tech the Crusher VRAs manage to pack under the hood, the attention to detail with the aluminum/vegan leather two-tone design give it the feel of a minimalist craftsman good. 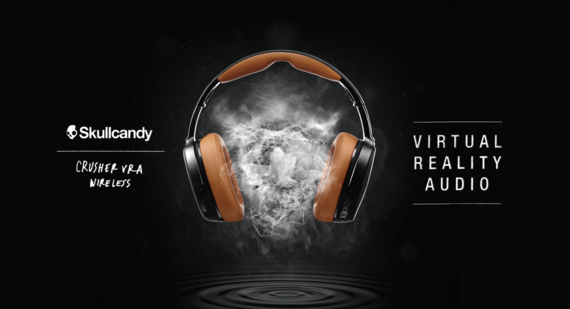 To put the power of these headphones on display, Skullcandy also partnered with MediaMonks to create Audioscape, a VR app they debuted at VRLA. Inside a VR headset, different custom loops are visualized as floating clouds that you can activate or deactivate. Meanwhile you can position the bass (represented through ferrofluid waves) anywhere on the "floor." All of which helps users understand the power of directional audio by letting them customize their music. This isn't a cockpit experience; in Airflow, you are what flies. When you strap into the rig, you're given instructions on what body gestures translate to which movements, and then you're transported to the sky overlooking the mountains below. You can fly all around the space, zipping up or diving down, twisting in loops or grazing the tops of the mountains. Fans are programmed to match the airflow coming at you with your flight movements, adding a heightened degree of realism to the whole operation. The vast majority of VR content can be experienced from the comfort of your own home, but Airflow is the clearest proof that installation experiences will continue to have the power to draw you into the real world for your VR jollies. An expo favorite was MacInnes Scott's "Grace," a room-scale music video featuring the most stunning cyborg to, ahem, grace VR. The duo behind the company (John MacInnes and Remington Scott) met while working together on the award-winning Call of Duty: Advanced Warfare -- MacInnes wrote the game and Scott worked as performance capture director. Even beyond that feat, their respective pedigrees speak for themselves: MacInnes is a Nicholl Fellowship winner and Scott is who brought Gollum to life in The Lord of the Rings: The Two Towers. Which helps explain why "Grace" is such a powerful blend of quality storytelling and striking visuals (and why people waited in a line that wrapped around the corner to see it). But what's most exciting about the company is their current pursuit; MacInnes Scott is about to redefine the documentary for virtual reality. How? By recreating historical events, such as the mission to capture Osama bin Laden, and allowing viewers to experience these events from any vantage point. The obvious benefit here is that storyteller bias all but disappears, letting viewer decisions dictate how the larger "reality" is perceived. They're essentially creating a whole new genre of storytelling. These are great minds doing great work; they do their homework and it shows. Their tenure on Call of Duty gave them experience working with and learning from those in the military, and in this case they've already begun interviewing those intimately involved in the mission to communicate an experience that mirrors what actually happened. From the scenes I saw, this captures the danger, paranoia, and claustrophobia in a way I never could have imagined. More importantly, this is a kind of storytelling only VR can offer, one that encourages viewers to understand all "sides" through repeat visits from different perspectives. We tend to talk so much about VR's narrative capacities that we can forget how transformative it will be in our daily lives. That's where Envelop comes in. The team at Envelop has been hard at work throughout the past couple years, and the result is clear: this is a revolutionary computing tool for a revolutionary medium. Why limit yourself to monitors when you could do all your computing in the great expanse of 360°? Forget tabbed browsing; assemble each page in front of you in open space. You can place them however you like, group them, and, tapping the newfound depth factor, position them along the z-axis. Envelop has done more than just transplant traditional computing into VR -- they've integrated the individual strengths of the new medium into their software. Imagine you're shopping for clothes and want to have a better sense of how they'll actually look on you. What if you could quickly pull up a 3D model of yourself and literally see (for) yourself? Or say you want to customize a car to your exact specifications before hitting the dealership to check it out in person. In my demo, I was able to do exactly that, even bringing myself inside the car for a close-up view of interior detailing. In fact, there are whole new kinds of visualizations that we haven't even discovered yet. In one mock-up graph I viewed in Envelop, a 3D map of the United States appeared before me. Each state emerged or sunk inward (as if in relief) to demonstrate voting patterns. I could position the map anywhere around me to study different angles. It's just one example, but it points toward the Pandora's box of VR computing Envelop has just opened. And my demo left me hungrier for more. 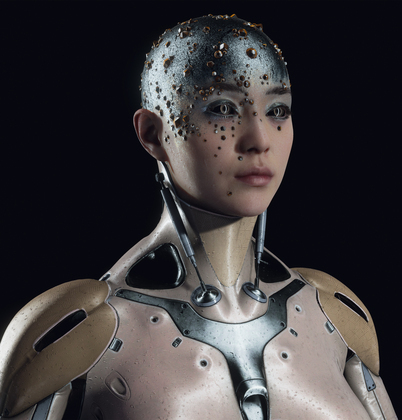 Short, well-crafted examples stood in for a larger vision of possible future AR applications. When you're inside the Meta 2, your whole world changes. You become a cyberpunk magician. I was able to grab digital objects with my hands, reposition them, and walk around them -- all the while they retained clarity as if they were physically there in the room with me. In another example, I pulled a tennis shoe straight off a webpage and deconstructed it to see its constituent pieces. Best of all, I got a taste of what holographic teleconferencing might look like when my guide broadcast himself in front of my eyes from a webcam across the room. The implications here are truly unfathomable. The Meta 2 is going to change the world. Star Trek holds a special space in my heart. Growing up, my dad and I would watch the latest episodes of TNG, DS9, and Voyager together each and every week. Star Trek continues to resonate across generations because of its warm, gooey center; no matter the struggle, no matter how bad things may get, what's most important is finding a way to work together, to find our power in unity. So it's fitting then that Ubisoft's Star Trek VR experience is a game you play not alone, but as a team. Each person (in groups of 4) chooses a different role aboard the U.S.S. Aegis. I manned the helm. As such, it was my job to fly us through uncharted territory and put us into warp. The Oculus Touch controllers were the perfect hardware choice for this game -- they already feel like futuristic machinery. My team was tasked with rescuing survivors while Klingon starships did what Klingon starships tend to do best. It's exhilarating and nerve-racking and everything you want out of a video game. My team barely made it out alive (we scampered off to warp with just 1% shield left), but we succeeded in the end. The world of collaborative and team-based VR is just beginning, but if Star Trek: Bridge Crew is any indication, it has a long, prosperous life ahead. Nvidia has been a leader in graphics technology for two decades, and they're showing no sign of slowing down. They recently released "VR Funhouse," a free game featuring VR takes on carnival classics that puts the incredible power of their technology to work. Not until you're in the Vive can you truly grasp the breathtaking clarity and detail Nvidia has achieved in "VR Funhouse." The green goop glistens and glops like real liquid, ceramics explode and clatter in perfectly randomized shards. When you run your hand over the heads of hair that jolt toward you, the haptic response is uncannily lifelike. 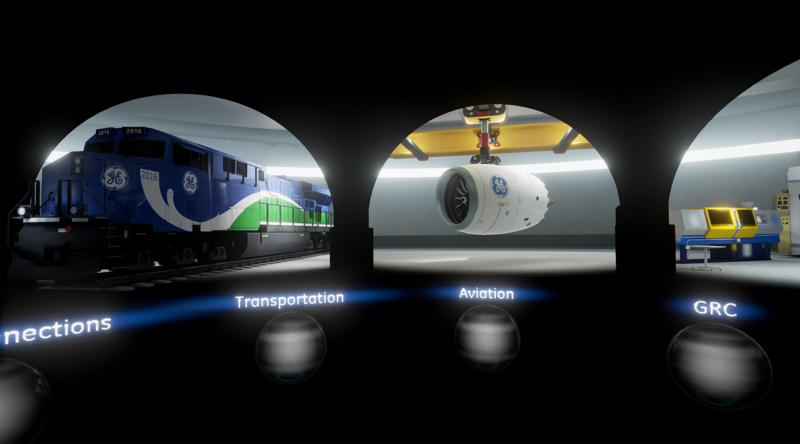 Attention to detail is vital in creating truly immersive experiences, and Nvidia's visual fidelity is second to none. Branded content is a complicated thing to pull off in VR. Since there's no accepted advertising model currently in place in the medium, consumer agency drives viewing. And with all the stellar content freely available, why would anybody bother with "commercials"? The team at Deluxe VR has built something that is essentially branded edutainment. 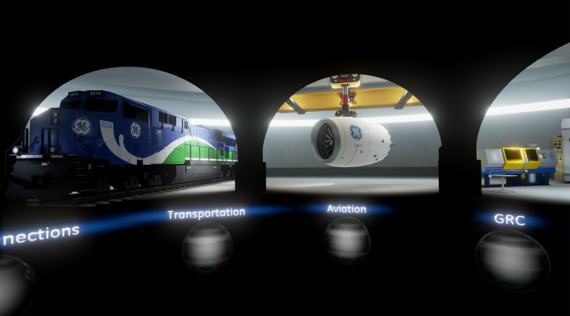 In it, viewers use the interactivity of the Vive to discover how interactivity among GE's various divisions serve to push innovation across the globe. In the experience, glowing balls correlate to particular divisions of the company. Viewers can pick up any ball surrounding them and combine it with another, transporting them to an ideal locale to witness firsthand how different sectors work in conjunction -- taking you as high as 35,000 feet in the sky and all the way down to the ocean floor. By giving viewers this simple agency, Deluxe and GE thumb the traditional advertising paradigm. Viewers are invited to participate of their own volition and learn at their own speed, creating a process wherein they seek out the content that interests them rather than have it foisted upon them. It certainly doesn't hurt that Deluxe produces some of the most beautiful content around. At the end of the day, nothing quite beats a good story told well. When I stepped up to try "Pearl," Technical Art Lead Cassidy Curtis encouraged me to wear one of the available blue Hyperkin faceguards (essentially a Ninja Turtles-style guard that protects your face from the foam of a VR headset). He started to elaborate on why, but then stopped abruptly. I assumed he just didn't want to say something unsavory related to general hygiene. Turns out he actually didn't want to spoil the story; "Pearl" is a real tearjerker. Director Patrick Osborne achieves a remarkable degree of storytelling craft and scene density, communicating a whole life in a few short minutes. The gorgeous visuals in this experience are matched only by the heartwarming tone; I dare you to watch "Pearl" and not tear up. Next up: an analysis of industry trends from VRLA.